Artists are often confronted with painting doors, windows and shutters ajar. This creates a problem: How do we make sure that the door actually fits the frame when it's seen half open? Surprisingly, mistakes are more common than you'd think, even among master painters. It's a head-scratcher that's bested the best. 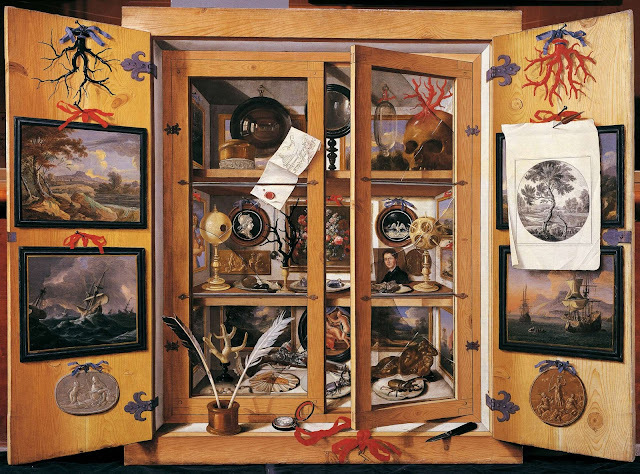 Cornelis Gysbrechts was a Flemish trompe l'oeil master known for his paintings of cupboards containing household objects depicted with stunning realism. Often, he included an open glazed door that revealed the contents within. However, his realism falls flat every now and then because if we were to close over his cupboard door we'd see that it does not fit the frame in which it is sitting. Not only that, but if we extrapolate the vanishing lines created by the glazed doors, we can see that they don't converge at distance points (above). At least make your lines converge at the vanishing point. This is a pretty big error, but it's not the biggest problem with the painting: it should be pretty obvious that if those doors closed, they'd be too big for the opening and crash into each other. To avoid this mistake, how do we determine the shape and size of our swinging door? Viewed from directly above, any opening window or door would describe a perfect semi-circular arc in space. Seen from an oblique angle, like say, standing in front of it, that perfect arc gets distorted to look like an ellipse. • The shorter the viewing distance (i.e. 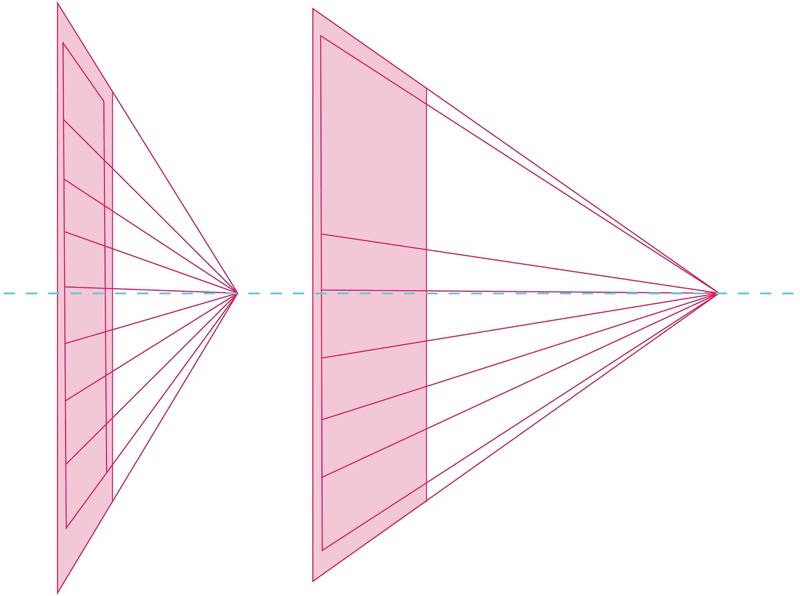 the closer the viewer is to the action), the wider the ellipse. • The longer the viewing distance (i.e. the further the viewer is from the action), the tighter the ellipse. The above illustration explains how. The cyan rectangle represents Gysbrecht's open cupboard. 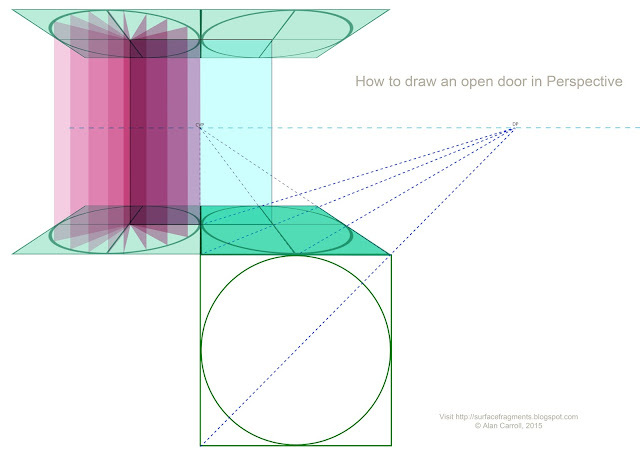 Draw a circle in perspective (dark green ellipse) with its center at the bottom of the hinged door. My blue dotted construction lines should help you figure it out. Explaining it in words is useless. I set my viewing distance here for about 6', or twice the approximate width of Gysbrecht's 3' canvas. It's too detailed to explain how/why in this post. Just note that now there are green ellipses above and below the door frame on the left and right. Anywhere your door swings (the doors are those pink shapes) its edges should touch the ellipse. Presto; correct perspective. (A) shows an infinitely long viewing distance. (B) shows a very close viewing distance. I did another post on viewing distance that might help to fill in. You can see it here. Now, in the case of the Domenico Remps cupboard the intended viewing distance is very short. Objects are painted more or less life size, and the whole scene is painted as if we were standing directly in front of the cupboard and opening the doors ourselves. However, Remps dispensed with the rules here because if we were truly standing that close, the open doors would be subject to extreme foreshortening (as in B, above). In actuality, with a viewing distance of 3' or less, the leading edge of the open doors would loom out towards us dramatically and seem quite large. Firstly, this would mean that his doors would be too large to be contained within the frame of the canvas - which would break the golden rule of trompe l'oeil painting. Which is ... all objects should be fully contained within the canvas. In other words; if objects are partly cropped by the frame, then it's a still life and not trompe l'oeil. Where were we? Oh yeah, painting doors in perspective. Secondly, it would make an ugly painting. So Remps bent the rules. But they still apply nonetheless. His open doors will clearly close tightly if we swung them shut. 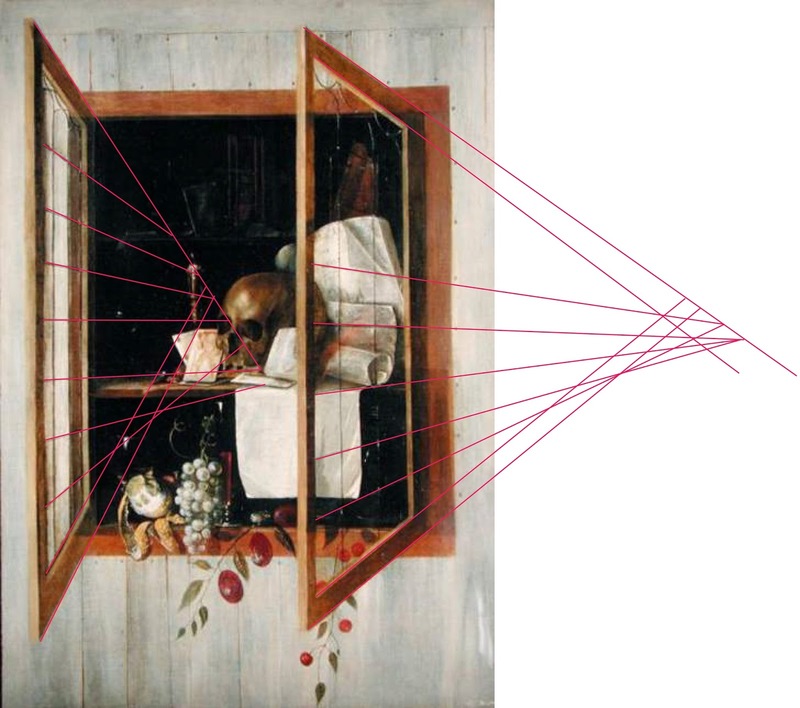 He simply tweaked the viewing distance to give himself a tighter ellipse (as if we were viewing from far away) so that he could fit the entirety of the open door within his canvas. Why? It looks better that way. It doesn't matter that it breaks with the illusionistic realism elsewhere in the painting. It was an artistic decision. Nevertheless, he made sure that no matter what, his doors were still painted according to the rules of linear perspective. They could close if he wanted them to. This is the important point regardless of the viewing distance: make sure your doors can close. This problem does not apply to doors alone. 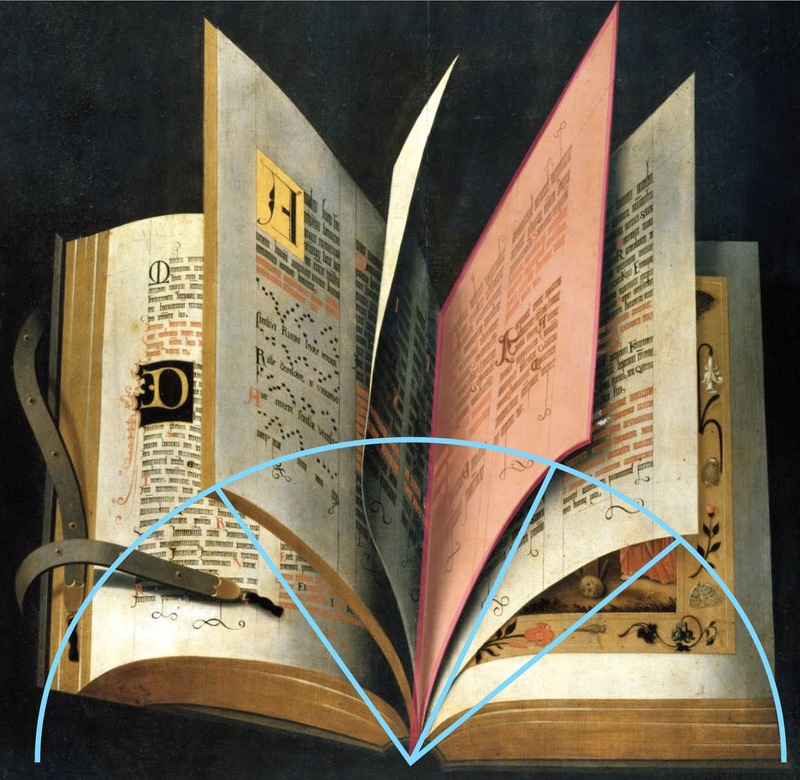 Above, we see that a fine trompe l'oeil painting from the Uffizi of an illustrated book is spoiled because of the unnatural size of the pages. Overlaying an ellipse reveals that one of the pages in particular (highlighted in orange) is way too big for the book. If that book were closed, the highlighted page would stick out an inch beyond all the others. 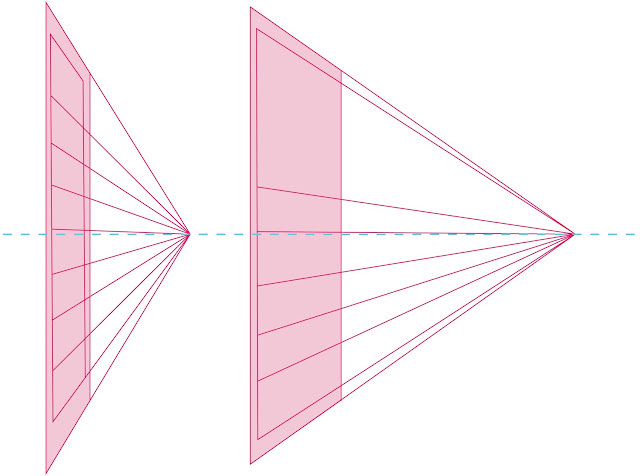 If anything, because the open pages are slightly curved, their edges should fall inside the ellipse and not outside. Below, I took a photo of an antique map and overlaid an ellipse to demonstrate that the edges of the stiff open folds align perfectly along the ellipse. Thank you so much for the fantastic instruction that you have given in the last couple of days - it has been so helpful to me as a self-taught painter. It is amazingly hard to find good, practical info like this about certain objects versus generic lessons on perspective. 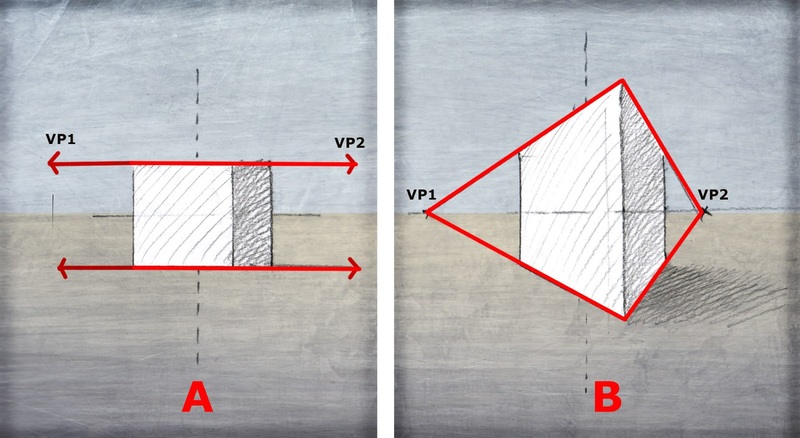 Can you also talk about how to construct an object so that it lays faithfully on a surface plane - such as a key on a window sill that is shown in perspective? 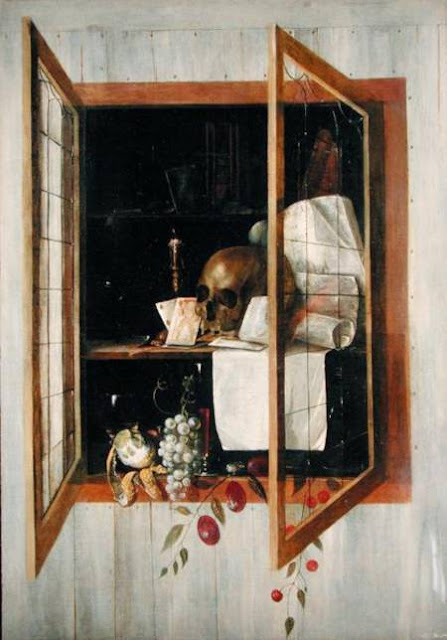 Also, I would be interested in reading more about tromp l'oiel vs still life that you alluded to above. I am similarly grateful! Thank you for sharing so much, so clearly. I never would have thought of that. I am also self-taught, (with a few formal lessons that never touched on perspective other than barely the basics.) Thank you.